In 1941, the best fighter aircraft in the USAAC was the P-40. Developed from the radial engine P-36, there was much in common between the two. The P-40, however, had a more powerful Alison liquid cooled V-12 engine, providing an increase in performance over that of the P-36. 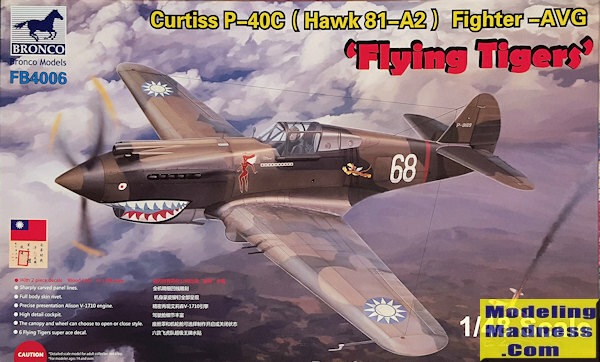 Initial P-40s were not quite ready for prime time as it is said, not having things like armor plating or self sealing fuel tanks, but reports from Europe and the slow realization that the US would be getting involved saw these items added. By the time of the P-40C, the aircraft was ready for combat. I would be safe to say that the P-40 was not a world beater. Other aircraft flown by the fighting powers were superior to it in many ways, however it was the best that the US had available and it had proven itself in the hands of the RAF in the North African desert to be able to handle considerable damage, have good hitting power, and in the hands of a good pilot, could even challenge Luftwaffe 109s. However, it was the plane in the hands of the American Volunteer Group that the early P-40 gots its best press. 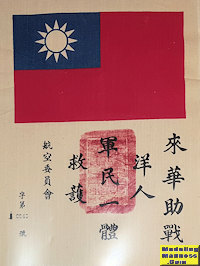 Fighting for the Chinese against the Japanese first in Burma and later in China itself, the unit was relatively successful during a time when successes were few and far between. Perhaps overly dramatized, nonetheless, the exploits of the unit's pilots were a real boost to morale back home and it did not hurt that their airplanes were a good match for what they were up against in terms of the IJAAF. There are times when a much desired kit is produced not by one, but by two companies at about the same time. 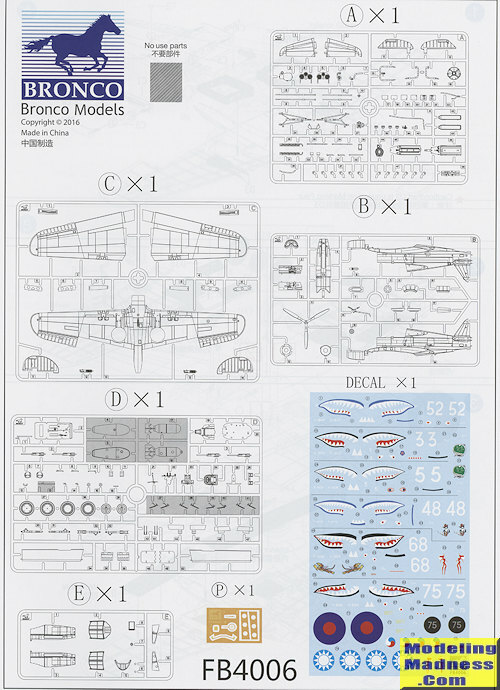 Bronco is the first with a new tool early 1/48 P-40, the Airfix's offering having been delayed. If you have seen any Bronc o kits, then you know what to expect in terms of the detail level. 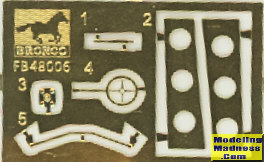 The kit includes a small photo etch fret which has inner forward gear well detail, gun sight bits, and bits for the engine. 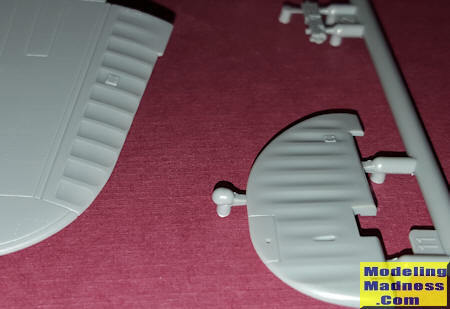 There are separate flaps, rudder and elevators though the ailerons are molded in place. The flaps have a bunch of ejector pin marks that will be difficult to deal with, but most everything else is free of these pesky things. Full wing machine guns are included for the lower wing as is a multiple piece main gear well. The gear can be modeled up or down and there are the correct number of small retraction/extension struts, something often missed in other kits. The cockpit is quite nicely done with harness detail on the seat, but it is pretty weak and I would think a resin replacement would look nicer. A full engine is provided along with engine mounts and an accessory section. Should point out that the exhaust stacks are separate and already hollowed out. This is built up and then inserted onto the rest of the airframe. The kit comes with clear side engine panels so you can show the engine detail. In that case, there are a few additional bits that will need to be added. The lower cowl flaps can be modeled open or closed with separate pieces offered for this. Thankfully, you have a well detailed radiator system so there will be something to see if you peer into that area. The kit also provides both an open and a closed canopy option. The closed option has a piece with the windscreen and canopy molded as one. A separate armored screen is provided to place behind the windscreen (another item often missed). Now, there have been areas of issue from those who have already seen this kit. One is that the cockpit is too shallow. I can't tell and frankly, for me it is not an issue, so I'll accept what has been reported. The second is that the canopy is rounded. This I can tell you is true. If you look at the back of the canopy, it forms an arc. The sides are not flat. Look at the image and decide for yourself how big an issue this might be. Note that the image is a wide angle taken wit h my phone. The other is that the fabric representations on the control surface are too extreme in terms of 'hills and valleys'. This is also true so you'll need to deal with that via sanding, filler or both if you want them smoother. Instructions are superbly done and are in color. You get detail images and every part that needs paint is shown painted, and did I mention it is in color? There are markings options for six AVG aircraft. All are in the US equivalent middlestone and dark green over a grey. Each of the tiger mouths, just like on the real planes, are a bit different. One option includes the RAF upper wing roundels as apparently they did not get around to removing these before the plane went in service. I had always thought the upper surface brown was dark earth. Again, you decide. The decals are superbly printed and should work beautifully. One item missing from the sheet are the rear fuselage bands. You will need to get those from another source or paint them. A neat addition to this kit is a large 8.5 x 11 inch 'blood chit' printed on a section of what looks like homespun cloth. It comes with a plastic sleeve to protect it, hence the highlights in the image. Apparently each one is numbered with this one being 0540. 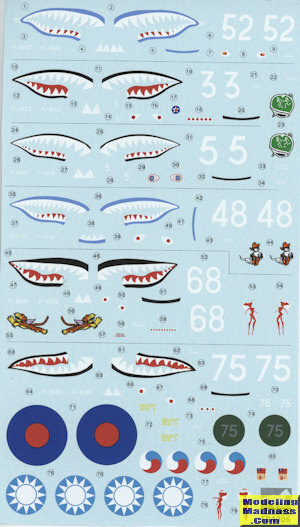 You will note that a decal of this is included for those who might want to do a pilot figure to go along with it. 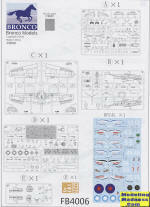 I am fully aware that there are those who may be dissatisfied with this kit and will wait to see what Airfix produces. That is fine, but judging on what I have seen from Airfix, the detail level will not be quite the same. Those who think that the kit needs a new canopy can undoubtedly source one from another kit or aftermarket. Speaking personally, I think it is a great looking kit. One that won't be all that difficult to build and one that I'm looking forward to starting.